General Francisco Pacheco executed by de la O's men. Emiliano Zapata announces "The nightmare of Carrancismo, running over with horror and blood, is at its end". Meanwhile Pablo González Garza feeds the newspapers with untrue Zapatista defeats. 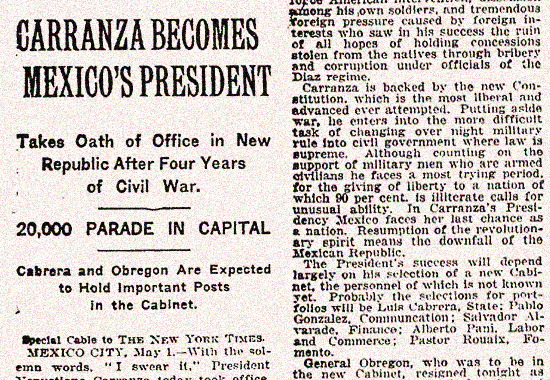 Venustiano Carranza announces a new constitution, the Mexican Constitution of 1917. Its predecessor was the Federal Constitution of the United Mexican States of 1857. The Constitution of 1917 is still in effect today. Revolt in Buenavista de Cuéllar. Revolutionaries try to break away from the authority of the General Headquarters of Tlaltizapán and its chief Emiliano Zapata. Otilio E. Montaño compromised. See May 15, 1917. Elections under the new constitution in every state except Morelos. Venustiano Carranza becomes officially president of Mexico. Today is the inauguration ceremony for the new constitutional president, Venustiano Carranza. Alvaro Obregon feels that his duty is done and resigns as Secretary of War. He fulfills his retirement dreams as a chick-pea farmer in Sonora. Emiliano Zapata orders an attack on the mutineers. Zapata, Genovevo de la O with 10,000 men fight at Buena Vista. Zapata wins. It is announced that Lorenzo Vázquez had been hung for treason. Court hearing for Otilio E. Montaño. This is a grave event and the hearing lasts until May 18. It is 1.00 am and Otilio E. Montaño's hearing is finished. The Court declares him guilty. Montaño arranges his affairs, kisses his family good-bye and gets executed by a firing squad in Tlaltizapán. In a pub fight in Cuautla, drunk Eufemio Zapata beats up the father of his sub, Colonel Sidronio Camacho. Camacho comes after Eufemio, guns him down in the street, flees north, and surrenders to the federals, the Carrancistas. Pablo González Garza admits his defeat. He receives a two-month leave of absence to visit America "on a personal basis". Emiliano Zapata rules Morelos, Venustiano Carranza rules Mexico. All the fighting leaves Morelos totally devastated again. Zapata rules a wilderness. Zapata tries to connect with other rebel groups including the Villistas but without any noteworthy success. Emiliano Zapata issues a manifesto, stating that Venustiano Carranza is a fake revolutionary and the fight must continue. Zapata asks Pancho Villa to sign the manifesto but didn't get any response. Pablo González Garza is back in the saddle and takes Cuautla. The Federals take Zacualpán and occupy Jonacatepec. The year ends with yet another stalemate. The guerrillas are in the mountains and the federals are in the major towns.